I have a confession to make. I don’t know how to say this…..but….. I’ve been bitten by the Korean bug!!! 😀 From watching Dr. Poison Ivy posting looks from K-Pop vids and then going on the discover my love for SHINEE I must admit I’m entranced. Searching endlessly online to score some Etude House products I came across a big stumbling block. I was not able to find a decent site for these products and the ones I found had ridiculous shipping charges! So when Lancy from MABH posted some of her stash from Etude and a link for the place she got it from I did a little happy dance 😀 and a cartwheel or two (heck if only I could have done one :p). Let me tell ya I was floored!! They have all the top Korean brands like Etude, Missha and even Skin Food!! The site is well laid out with it being divided into categories like Skincare, Pack/Mask, Makeup, Cleansing, Sun care, Body, Men, Samples and Brand. I especially liked the samples part. 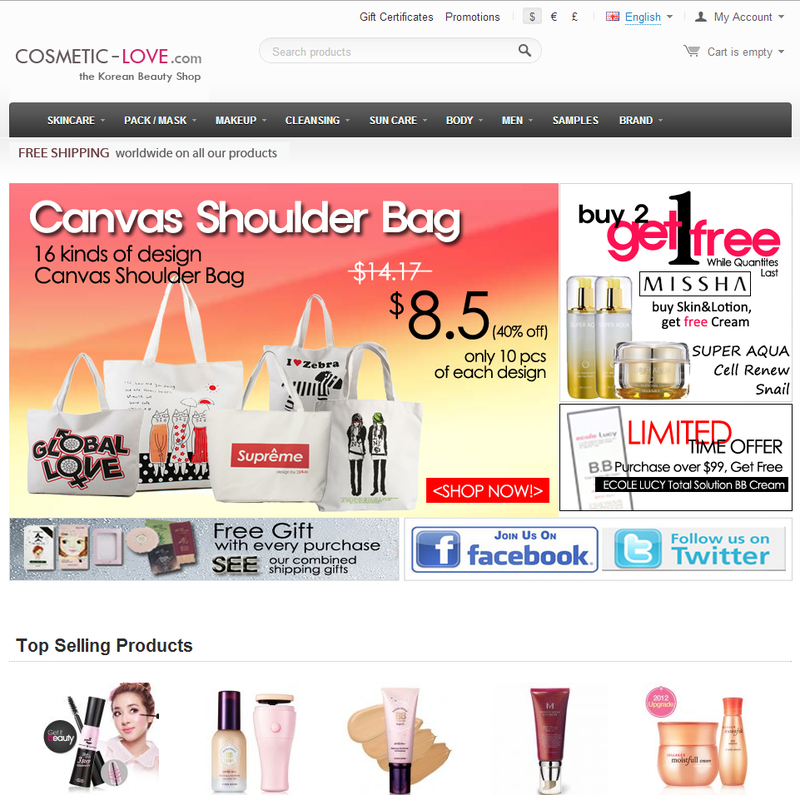 You can try out some different BB creams, skin lotions, etc for a nominal price. At the time I first placed my order they were doing a special where you could buy samples of 12 different BB creams in one pack for a nominal fee of $6.98 (Rs. 377/- approx). Apart from that I bought a facewash from Etude called Happy Cleansing Foam in the variant Essential Hyaluronic Acid for $9.48 (Rs. 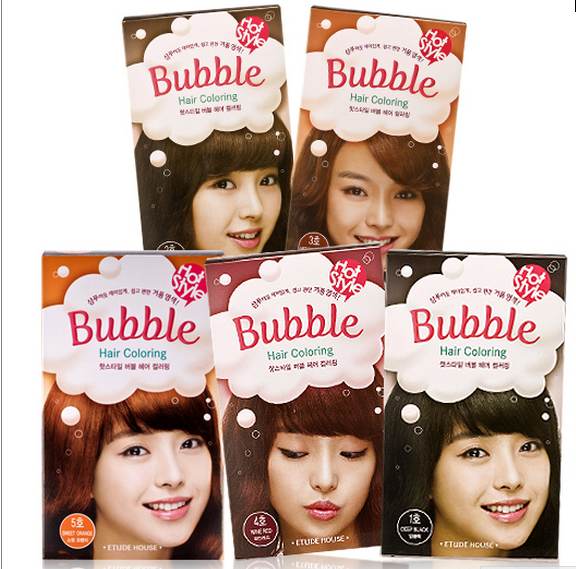 512/- approx), Hot style Bubble Hair Coloring in Deep Black again from Etude for $13.42 (Rs. 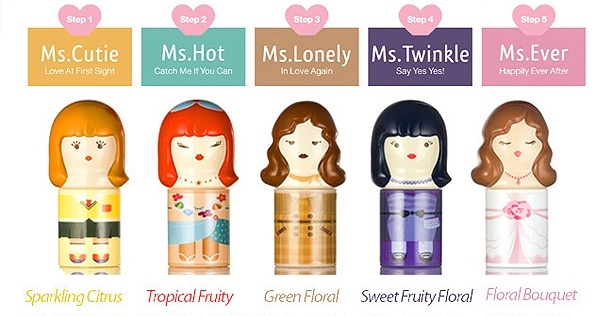 725/- approx), Etude MiniME Perfumed Stick in Ms. Ever for $11.76 (Rs. 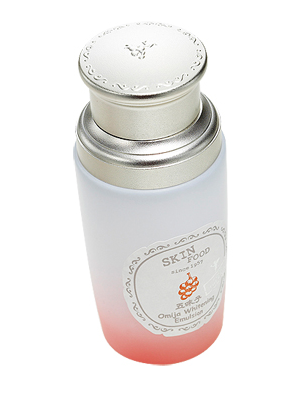 635/- approx) and Skin Food Omija Whitening Emulsion Brightening Effect for $23.17 (Rs. 1251/- approx). So for a package worth $64.81 can anyone guess how much I paid for shipping?? $20? $10? ANH….I paid $0!!! I chose the Korean Post option without tracking and end up paying nothing for shipping. The estimated delivery date is 10-15 days. You have an option of paying between $3-4 to get the benefit of a tracking number for the same delivery time. And you have an express delivery option as well where you can get your package within 3-5 days but that has a high delivery charge. I got my package within 15 days from the date of purchase. It was sent over by local post and I did not have to pay any custom duty (thank god!). They packed it with air pillows (plastic baggies filled with air) to protect the stuff. Lets just say they did a real good job coz the Skin Food emulsion was in a heavy glass bottle and it was alright (yea!). And apart from all the goodies I bought I was sent over some really neat free gifts with my purchase. 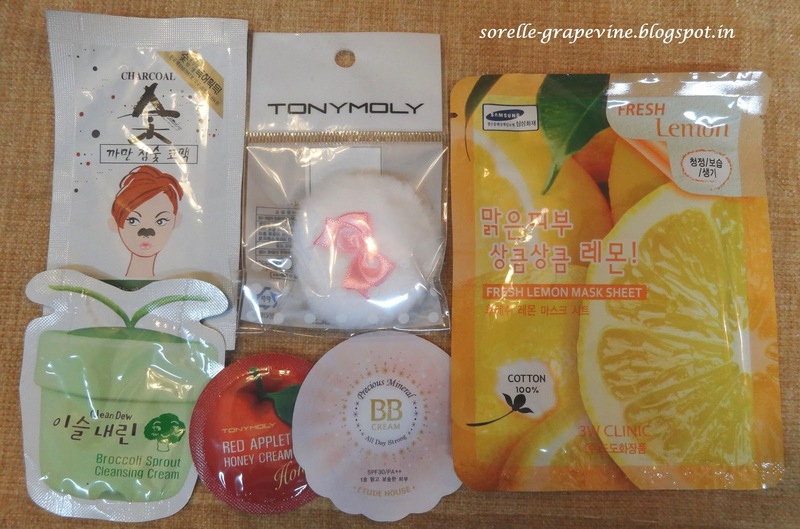 A Tony Moly powder puff (so cute – all white with a pink bow packed in a white polka dot package), 3W Clinic Fresh Lemon Mask Sheet, Tony Moly Red Appletox Honey Cream sample, Nesura Charcoal Nose strip, Clean Dew Broccoli Sprout Cleansing Cream sample and Etude House Precious Mineral BB Cream sample (phew). Ahh some good retail therapy! Nothing like it. Are you still sitting and reading this?!? Go and get your cool Korean stuff now. I will be posting detailed reviews for the products later (Yes I will!! Humph!). So until next time ladies – Happy Shopping!! Would you purchase from them again? – 2nd package already on its way. Need I say more?